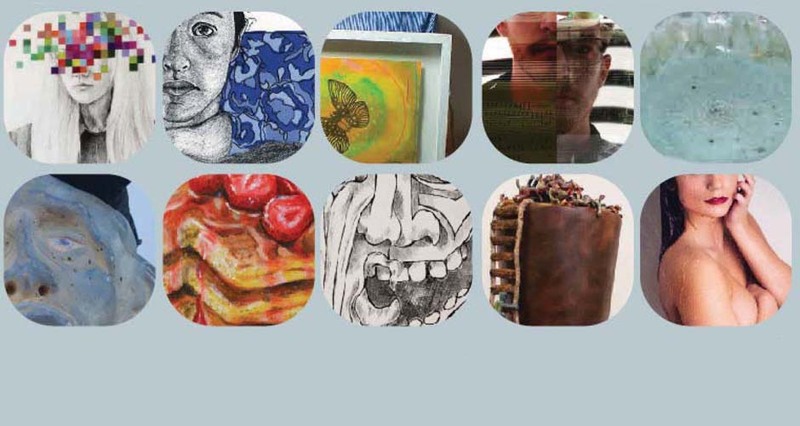 CityArts will host the opening of four new exhibits from 6-8 p.m. on Final Friday, Feb. 26, that celebrate the work of artists in the Wichita area. The shows will be on display through March 19. This exhibition will celebrate the rich history of glass art throughout Kansas and will feature dozens of glass blowing artists of various levels and aesthetics. CityArts is home to the region’s only glass blowing studio that is open to the public and offers classes to all levels. Since the studio was built, CityArts has hosted hundreds of artists specializing in this exciting and complex art form. Featured artists include, in alphabetical order: Greg Anderson, Kim Anderson, Nikki Cribbs, Chad Droegemeier, Connie Dutton, Scott Garrelts, Ethan Hall, Rollin Karg, Robin Lies, Casey Socha, Kelly Taylor, Roger Ward and Mark Yembrick. Rachel Foster’s series of paintings represent a slice of everyday life. “They are members of my community and family, but they could be anybody,” Foster said. Foster likes how common experiences and desires bind humanity together. She is an instructor at Butler Community College and Wichita State University. Lyda Andrews, a California native, began painting in the abstract style in the late 1990’s. “I like to move with the fluidity of the paint using color, line and rhythm to convey my feelings and emotions,” Andrews said. She draws inspiration from music, memories and feelings from deep within herself. Andrews received her fine art degree from Wichita State University and is an active member in Gallery XII’s cooperative fine arts gallery. Ellipses, both organic and cellular, show the essence of life and nature at its most basic level. Wichita newcomer Amelia Schroeder chooses bold colors and implied movement to characterize her body of works. Schroeder says that nature is the best piece of art she has ever seen, and that her work evokes childhood memories of discovering water, wind and trees. “I am influenced and inspired by the patterns, luminosity, colors and shadows of our planet,” Schroeder said. The Arts Council and CityArts are co-presenting a series of panel discussions designed to help individual artists throughout the community build sustainable careers. Admission is free to the series. Artists may attend any session of their choosing. All panels will be held from 1-3 p.m. on Saturdays at CityArts. Admission is free to CityArts’ exhibition galleries that are open 9 a.m. – 9 p.m., Monday-Friday, and 9 a.m. – 4 p.m., Saturday. CityArts is located at 334 N. Mead in Old Town Square. For more information about the shows or to purchase artwork, please contact CityArts at 316-350-3245 or cityarts@wichita.gov. First of all, Thank you to all who came to the opening of the Crazy 8’s Show! What a beautiful show and successful opening! Thank you too to our wonderful judge, Joe Goodwin! There is still plenty of time to see the show and maybe find a piece that is calling your name…..however there is a sea of red dots on the wall so don’t wait too long! Crazy 8’s will be on view through Feb 23rd. Make sure to check out our facebook page to see pictures of the show! Meet the artist and see his exciting new pieces on Final Friday, Feb. 26th from 6:30 – 9:00 pm. CULTURE, TRADITION, ART & STREET FASHION. Explore the dynamic relationship between societal norms (acceptance) vs. personal truth (rebellion). Artwork by our friends local artist/owner Kham Smith (Symbolic Tattoo) in Delano. Come & be inspired by his collection of drawings, tattoos, art & more! TISSU’s rebellious street fashion collection will also be on display, inspired by Spring 2016 runway trends. Vietnamese/Chinese New Year (called “Tet”) is celebrated all month long & honors community, family, friends, peace, love & new beginnings! Stop by, support local, see cool stuff & rub a Buddha’s belly for eternal good luck & fortune. The Velvet Fever will be performing 6-8pm, and B.S. Sandwich Press will be serving food all evening! Join us in welcoming February resident, Robyn O’Neil as she shares her collaborative drawing project, The Great Kansas Sea, with Harvester Arts. This project is inspired by The Permian Sea which covered much of Kansas 250 million years ago. Harvester Arts and Robyn O’Neil are bringing it back in The Great Kansas Sea, a large-scale collaborative drawing. Imagined lands, the psychological effects of being underwater, and the meditative nature of ocean waves are all a part of the motivation behind this project. We also simply want to create a beautiful seascape utilizing the individual hands of hundreds of people. Any and all are welcome to participate. Those interested in helping create the sea should simply draw or paint water. Waves. Ocean. Cover the entire page. Your water can be wild or calm. It can be cartoony or romantic. Just draw water the way you like to see it. No creatures or fish or people; just water. Use any kind of drawing paper, anything better than computer paper will be fine. Keep it under 18” x 24”. Most people are using 8” x 10” sheets. Using pencil, pen, ink, watercolor (anything black or grey – no color please), So we can give you proper credit, please write your name legibly on the back of the drawing with an arrow indicating which way is up. Completed pieces should be dropped off at Harvester Arts at 215 N Washington on Monday 2/22 from 2-6 PM or Tuesday 2/23 from 2-6 PM. The opening of The Great Kansas Sea will be Friday, February 26th at Harvester Arts from 7-10pm. Robyn was born in Omaha, Nebraska in 1977, and currently lives in Los Angeles, California. Her work was included in the 2004 Whitney Biennial. She is the recipient of numerous grants and awards, including a Joan Mitchell Foundation Grant. O’Neil has had several traveling solo museum exhibitions in the United States, and has been included in numerous acclaimed group museum exhibitions both domestically and internationally. She also received a grant from the Irish Film Board for a film written and art directed by her entitled “WE, THE MASSES” which was conceived of at Werner Herzog’s Rogue Film School. Local and regional collections include the Ulrich Museum of Art, Wichita State University, Wichita, Kansas and The Kemper Museum, Kansas City, Missouri. Her work represented by Susan Inglett Gallery, New York City; Talley Dunn Gallery, Dallas; and Western Exhibitions, Chicago. Harvester Arts launched in February of 2014 to provide the local community access to the working processes of professional, nationally and internationally recognized artists through programming of quarterly exhibitions and events. The mission of Harvester Arts is to provide a thoughtful platform for visual arts experimentation that engages the community through critical dialogue and the creation of new work. To accomplish this, we bring Resident Artists from across the country to Wichita four times per year for two weeks to create an installation or performance of new work. The Resident Artists act as catalysts to provide fresh ideas and be a sounding board for dialogue. We partner the Resident with local artists, student groups, and area creatives (referred to as Satellite Artists) to engage with each other’s ideas and processes. Once the Resident Artist has completed an exhibition, the Satellite Artists continue the conversation by creating new work in response. Maddie Grant is a student at Wichita East High School who sees herself as “an imaginative and impulsive photographer of everyday life.” She captures the beauty of people, places, and things through her photographic insight. “Impulse and Imagination” showcases images of her friends and East High family in her first gallery show. Rachel Rutledge has always enjoyed creating art and is influenced by animation and fashion. She explores money and its meaning and invites viewers of her work to reflect on the role money plays in their lives. “Collective Welfare” features complimentary colors, large perspectives, and simplistic rendering. The exhibits will be displayed through April 29, in the William J. Reals Gallery of Art-East. The University of Kansas School of Medicine–Wichita educates doctors for Kansas while improving the health of Kansans through research and innovation. Final Friday Exhibition Hours: 5-8 p.m.
Monday through Friday from 9 a.m. to 4 p.m.
An “Art for Lunch” presentation by the artists will be held Tuesday, March 1 from noon to 1 p.m. in the gallery. A light lunch will be served on a first-come, first-served basis. Guests can also bring their lunch. This event is also free and reservations are not required. The Susan De Wit Fiber Group includes seven women, who collectively have nearly 500 years of life experience that have taught them something about the spiritual, holy, and venerated. They all bring their unique approach to the topic through fiber art. Theresa Harrison said her sense of holy is grounded in her travels. “No matter which culture, which continent, which biome, nature’s bounty touches deep into [the] soul” she said. Paula Smith said that she feels natural fibers have a divine vibration connected within them. When working with and deciding what to make out of a certain fiber, she said she feels a divine dance between her energy and the subtle energy of the fiber. Pam Bjork takes intimate photographs of the Tengenan Balinese sacred Geringsing textile, which she said reflects the powers ascribed to the cloth: healing, protection and magical potency. Connie Lenoard-Volkman believes that when using manmade fibers such as lutradur and Tyvek, “… there is a constant relationship between construction and destruction…in nature, and perhaps in the spirit.” Mary Sue Foster said the inspiration for her work in this show draws from special stories in the Bible that can be summed up with the phrase “To those leaning on the sustaining infinite, today is big with blessings.” Nancy Squire places significance in her spiritual side when working with fibers. Susan de Wit explores what it means to be more human. She seeks through meditation for the point when the meditator transcends and becomes a little more than he or she was moments ago. Lindy Wiese and Sean Christopher Ward will display their works in the back gallery. Sean Christopher Ward and Lindy Wiese will be holding a fire sale in the back gallery, with artwork up to 85% off regular price.